The 2.4MW wind turbine off Choshi, Chiba Prefecture. Image: TEPCO (archive). Tokyo Electric Power Company Holdings (TEPCO) is mulling a 1,000MW project in Japan that could be built off Choshi in Chiba Prefecture, The Japan News (The Yomiuri Shimbun) reports. TEPCO plans to set up an offshore wind farm comprising 200 5MW wind turbines, installed on fixed-bottom foundations, according to The Japan News, which further writes that the Japanese company plans to partner with a European offshore wind player to bring the project forward. The project has been reported to be worth USD 9.2 billion (approx. EUR 8.03 billion). On 1 January 2019, TEPCO launched its first commercial offshore wind turbine in Choshi – a 2.4MW machine also installed on a bottom-fixed foundation. TEPCO began conducting offshore research off the coast of Choshi in August 2009, under a public initiative organized by the New Energy and Industrial Technology Development Organization (NEDO). In the years since, TEPCO has surveyed weather conditions, sea life and the potential environmental impact of offshore structures in the area. In mid-November 2018, the company kicked off seabed survey operations off Chiba Prefecture to ascertain the bedrock structure of the seabed for a possible project. The works will be taking place until the end of January 2019. Also, since January 2013, TEPCO and NEDO have been testing the 2.4MW turbine, Japan’s first offshore wind power generation facility. The test has provided TEPCO with experience in facility operation and maintenance as well as equipment safety and resistance to corrosion and other conditions. 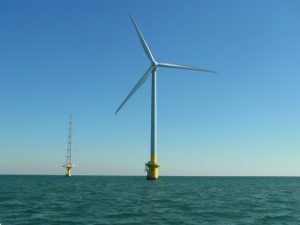 As a result, the Japanese company confirmed that the fairly shallow depths and high winds along the Chiba coast offer excellent conditions for an offshore wind farm. According to The Japan News, TEPCO is ramping up its renewable energy game to cover the costs of decommissioning reactors or removing remaining radioactive substances following the accident at its Fukushima nuclear power plant.